April 11, 2014 by Ecommerce News. About Mobile with tags Europe. 4764 views. 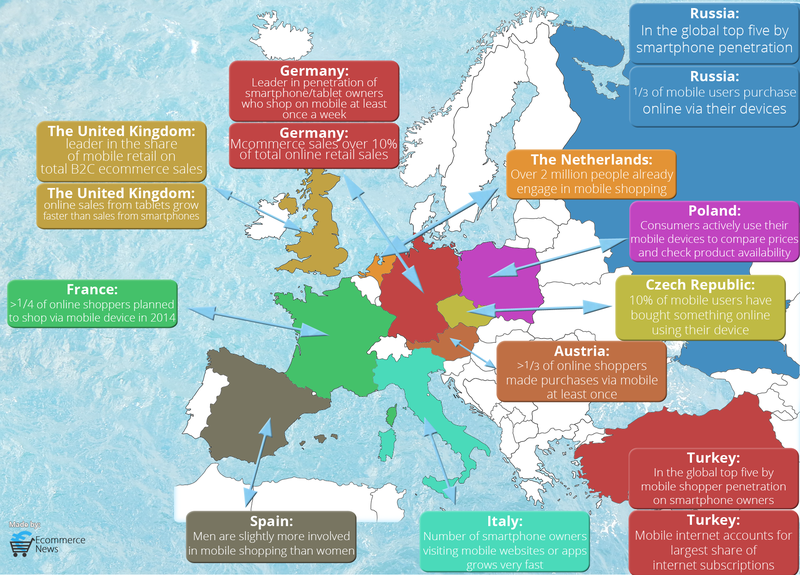 To be able to make this overview, we used data from yStats’s latest research on mcommerce in Europe, called ‘Europe M-Commerce Snapshot 2014‘. In our colorful infographic you can read short info about the mcommerce industry in popular ecommerce countries like The United Kingdom, Germany, France, Spain, Italy, Russia and Turkey. You will read that in Spain men are slightly more involved in mobile shopping than women and that in The Netherlands over 2 million people (of a total of 17 million inhabitants) already engage in mobile shopping. You’ll also learn that over a quarter of online shoppers in France have planned to make a purchase from their mobile devices in 2014, while over a third of online shoppers in Austria made purchases via their mobile devices at least once.